FOOTBALL: PENN STATE v Temple; Mastering the Art of Football Tailgating. 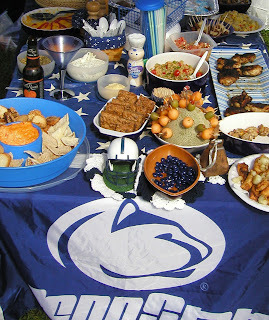 PENN STATE v Temple; Mastering the Art of Football Tailgating. 2012 marks the centennial anniversary of the birth of Julia Child - the original culinary rebel. Julia Child saw challenges as opportunities and road blocks as the chance for a new adventures. She translated and demystified the previously elusive French Cuisine for the American home cook with her seminal publication "Mastering the Art of French Cooking." She of course soon became a household name with her PBS cooking show, the first, and still likely the best, of its kind, "The French Chef." At an age when many of her contemporaries were retiring and taking it easy, she continued to develop and discover. And that is why we are celebrating her work and spirit this week as we further our quest of "Mastering the Art of Football Tailgating." We will be serving a variety of foods and beverages - some inspired by Julia Child and some directly from her published recipes. Expect to see, and enjoy: Roast Chicken; grilled beef; quiche; gougeres; onion soup; pesto palmiers; a variety of meats & cheeses; desserts, including Ms. Child's favorite "American Brownie;" and, so much more. Penn State hosts the Owls of Temple this week. Kickoff is at 3:30pm - so the parking lots will open at 8am. For those of you who can't make it to the stadium, the game will air on ABC/ESPN. Temple sports uniforms of Cherry and White (for which they will fight). But that's no problem, because we will all be donning our best navy garb for the stadium-wide Blue Out, supporting the victims of child abuse. It is also All University Day and PSU will be honoring the 1982 Championship Team during the game. We park in the Green Parking lot (behind the West/Pressbox side of the stadium), and our spot is in the first row of grass parking (right next to the soccer field). We'll be flying our PSU flag and the flag of Quebec (blue field with white cross and fleur de lis). Message/email for additional directions/information. All are welcome - feel free to stop by or stay the day. Contributions are appreciated but not required; if there is something that you just have to have - please either let us know, or bring it with you.